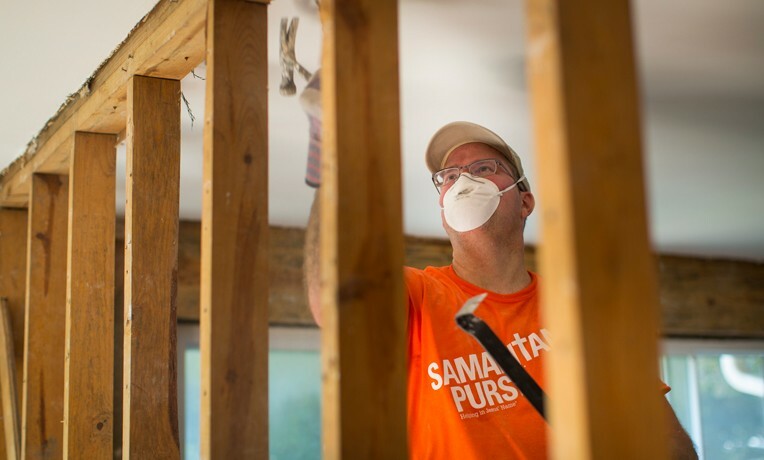 "I Say Thank God for Volunteers"
An Iowa homeowner's heart is changed by the Gospel as Samaritan’s Purse volunteers help Marshalltown residents clean up after an EF3 tornado. UPDATE (Aug. 2): Our work has now been completed in Marshalltown, Iowa. More than 330 individual volunteers served 108 homeowners. We praise God that 19 people trusted Christ as their Lord and Savior. We are grateful to Marshalltown Evangelical Free Church for their support as our base of operations. For both weather forecasters and residents, a tornado in Marshalltown seemed unlikely on July 19. Homeowner Manuel Balderas described the sky as bright and blue just seconds before he had to rush his family down into their basement. Another resident, Mary Johnston, said she didn’t give the storm sirens a second thought before she was “filled with fear” as wind demolished her garage and her car. Homeowner Mary Johnston’s garage was dismantled and removed by volunteers after it collapsed. “When we moved to Marshalltown 40 years ago there had never been a tornado here,” said homeowner Barbara Duffy as Samaritan’s Purse volunteers cleared a massive hardwood tree from her yard. “Something about the position of the Iowa River and the lay of the land. They said a tornado will never strike Marshalltown,” said 73-year-old Dean Calkins, another homeowner whom we helped. He was in an upstairs room when the EF3 tornado shook his home. Before it reached him it had torn through main street, ripping up historic buildings and churning up residential lanes. The destruction was devastating and unexpected in this quaint downtown surrounded by vast swaths of farmland. Our staff and a disaster relief unit—a tractor-trailer filled with supplies and equipment—were on the road the very next morning to Iowa. Since Sunday, July 22, scores of our volunteers have worked on dozens of homes in Marshalltown cutting and clearing trees from yards, removing debris from downed structures, and offering words of encouragement to homeowners. Billy Graham Rapid Response Team chaplains report that eight people, so far, have prayed to receive Jesus Christ as their Lord and Savior. The pile behind Dean Calkins is what’s left of a garage he built by hand several decades ago. By God’s grace, Dean survived the EF3 tornado and has found new life in Christ. Dean Calkins was among those whose lives were changed by the Gospel. He told our volunteers he was oblivious as the storm approached. He thought nothing of the nearby sirens wailing. He’d heard them before and nothing had happened. But after what he experienced next, he’s surprised he’s still alive. The twister toppled a large hardwood tree onto Dean’s property, barely missing his home but obliterating a garage he had built by hand decades before. His long-held belief about a tornado-free Marshalltown was forever changed. And as Samaritan’s Purse volunteers showed up at his door and began work in his yard this week, Dean’s long-held beliefs about a lot of other things changed as well. Volunteers provided a signed Bible and prayed for Dean after completing work on his home. “I’ve had many conversations with the volunteers. I say thank God for volunteers,” he said. At first Dean was resistant to prayer or talking about anything spiritual, but over the course of a few days his heart began to soften toward the Gospel. Praise God that after receiving a Bible signed by volunteers on Tuesday, he prayed with Site Team Leader Dan Boerman to receive Jesus Christ as his Lord and Savior! A desire to see God change people is why volunteer Jill Hagen started serving with Samaritan’s Purse this year. She had been praying about what to do next as she and her husband approached their retirement years. Jill served in her first response with us doing mud-out work in flooded parts of Kauai, Hawaii, earlier this year. After leaving Marshalltown, she will help with rebuild efforts in Pearland, Texas. Her husband is a physician, and the couple hopes to serve internationally through our medical arm, World Medical Mission. “When you can love on people and just genuinely care about them, people take note,” Jill said, describing the power of disaster relief in building a platform for the Gospel. Please join us in prayer for the hurting people of Marshalltown and surrounding areas and for the safety of our volunteers and staff.